All ages are invited to attend this event where we take you behind the scenes of Public Works. Visitors can tour the facility and ask questions of the staff about their jobs and public works operations. WHERE: Public Works Facility, 5101 Walnut Ave. Kids will love the displays of big equipment. Bring your camera! Also for the kids, visit the various displays, get your sheet stamped and enter the drawing to ride on a public works vehicle in the July 4th Parade. Adults can enter the drawing to win either a rain barrel or a young tree. Have a little fun in our Photo Booth! 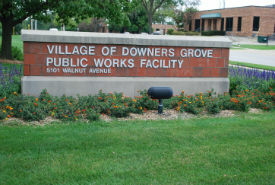 The Open House is part of the Village's recognition of National Public Works Week, which calls attention to those dedicated to providing quality services in the public works arena. Service areas include water, street maintenance, forestry and landscaping of public areas, engineering, traffic, stormwater and snow removal.